QuestionForm focuses on surveys and is easy to use, but limited at Free level and pricey for others. You can find other builders that offer more features for a lower monthly fee, but it does offer unlimited responses. 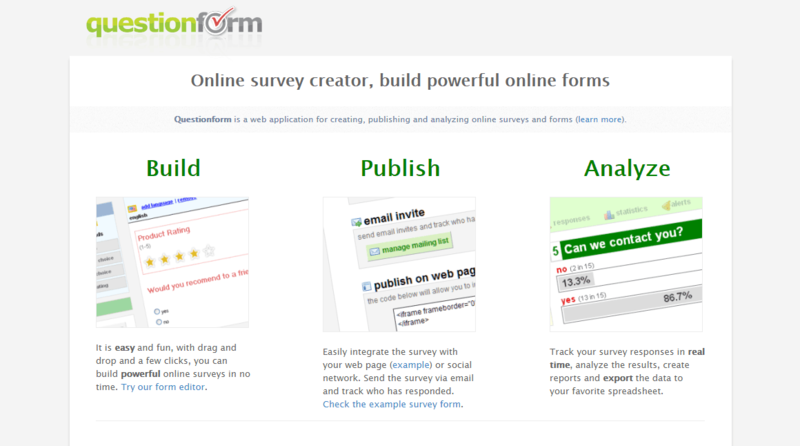 QuestionForm stands out for its online survey creator to build compelling forms. If you require surveys on your site, QuestionForm is the answer. There isn’t much else on this platform. If you need to carry out surveys, you are going to access a platform which specializes in surveys and Question and Answer tools. QuestionFrom’s multi-language version surveys address a worldwide audience. Admittedly, the free level version of the product is somewhat limited and only offers two active surveys to select from. If you are serious about surveys, the top tier plans offer you the best in the market. Want to know if QuestionForm is right for you? QuestionForm does not include any templates for users on the basic plan. Template Selection: None at the Free level. Customization: Surveys may be adjusted with themes but you need to customize them yourself. This is easily done by clicking Header, Body, Actions, or Background and adjusting the available parameters. You can change your color schemes, fonts and sizes, add your logo and upload images. You can’t do much on the Free QuestionForm account. The editor is very simple to use: drag-and-drop and click to edit. No HTML editing required. Swiftly create and deploy complex multi-page surveys in minutes. The interface is clear, fast and fun. You may make changes to your survey anytime, even after receiving data. The survey builder is very user-friendly to construct forms. The design and interface are clean, clutter free and easy to navigate. The drag-and-drop tool allows you to drag elements into your survey and place them wherever you see fit. Feel free to experiment with star rating systems and other cool features! At the Free level, you can get a support ticket or email; no access to forum, tutorials, or user videos. It is exceptionally easy to use. The pricing for QuestionForm is high, particularly considering there are only surveys on the menu. Apparently, there is a niche for online surveys, or they would not get away with these prices. Buyer beware! It is possible to build more intricate, powerful surveys for free or a fraction of the price. The Premium Plan offering unlimited surveys, questions and responses costs $49 per month. QuestionForm does one thing and one thing only: surveys. To that end, their drag-and-drop editor is very easy to use, and they do offer unlimited results and stats for your (2) surveys. If you just need a couple of surveys and simply hate the fuss of other more complex builders, QuestionForm is for you. Like QuestionForm Review? Visit QuestionForm.